Dimercaptosuccinic acid (DMSA) is an analog of dimercaprol used as metal chelating moiety in variety of conditions. In nuclear medicine itself two types of Tc-99m DMSA complexes are used, trivalent and pentavalent forms. In this review, we have discussed the mechanism of uptake of both complexes as well as diagnostic and therapeutic application in a clinical scenario. Aim: This study was aimed at standardizing the "In-House fatty meal" methodology in cholescintigraphy and to determine gall bladder ejection fraction (GBEF) with this standardized meal. 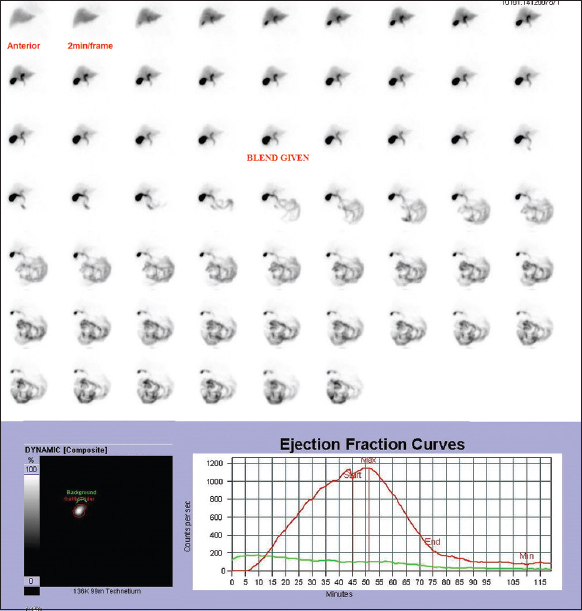 Materials and Methods: This is a prospective case–control study where 61 patients having right upper quadrant pain and postprandial bloating and 59 healthy volunteers were included. They underwent 99mTc-mebrofenin fatty meal cholescintigraphy following a standard protocol. Dynamic acquisitions over 120 min were done, with a fatty meal being given between 45- and 60-min. Gallbladder emptying kinetics was studied by assessing the time activity curves and calculation of GBEFs were made at 30-min, 45-min, and at 60-min and assessed. Results: The GBEF at 30-min was 74.42% ± 8.26% (mean ± standard deviation), at 45-min was 82.61% ± 6.5%, and at 60-min was 89.37% ± 4.48% in the volunteer group. The lower limit of GBEF in volunteers at 30-min was 58%, 45-min was 69%, and at 60-min was 81%. Receiver operating characteristic (ROC) analysis showed that 30-min GBEF provided the best separation between healthy and diseased subjects with an area under curve of 0.952 (95% confidence interval = 0.914–0.989). The lower limit of GBEF at 30-min was 58%. Conclusions: An in-House standard fatty meal could be a reproducible alternative to cholecystokinin as it is well-tolerated. Based on ROC curve analysis, we propose that 30-min GBEF provides good separation between healthy and diseased people with this in-House fatty meal. Hence, dynamic acquisitions beyond 30-min postingestion of the fatty meal may not be warranted. Purpose: The purpose was to find out the efficacy of fixed 15 mCi radioactive iodine-131 (RAI) dose and predictive values of various factors for inducing hypothyroidism in Graves' disease (GD). Materials and Methods: Retrospective study conducted from January 2012 till August 2014. Patients with GD who had a technetium-99m thyroid scan, thyroid antibodies, received fixed 15 mCi RAI and did follow endocrine clinics for at least 6 months were selected. RAI was considered successful if within 6 months of RAI therapy patients developed hypothyroidism. Results: Of the 370 patients with GD who had RAI during study period, 210 (57%) qualified study criteria. Mean age of patients was 48 ± 15 years with female: male ratio of 69:31, positive thyroid antibodies in 61%, means thyroid uptake of 15.09 ± 11.23%, and presence of pyramidal lobe in 40% of total population. Hypothyroidism was achieved in 161 (77%) patients while 49 (23%) patients failed to achieve it (remained either hyperthyroid or euthyroid on antithyroid medication). Patients who became hypothyroid were significantly younger with higher proportion of presence of thyroid antibodies and pyramidal lobe and lower percentage thyroid uptake than those who failed. Multiple logistic regression analysis revealed that age (odds ratio; OR = 2.074), pyramidal lobe (OR = 3.317), thyroid antibodies (OR = 8.198), and percentage thyroid uptake (OR = 3.043) were found to be significant prognostic risk factors for post-RAI hypothyroidism. Gender was found to have nonsignificant association with the development of hypothyroidism. 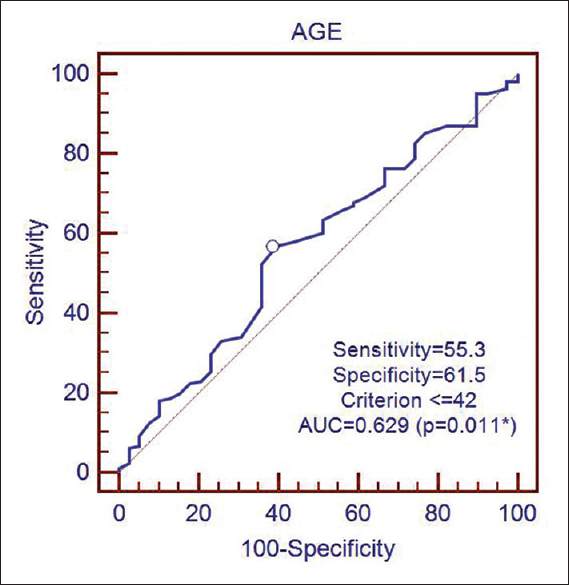 Receiver operating characteristic analysis revealed age <42 years and thyroid uptake <15% as threshold values for the development of post-RAI hypothyroidism. Conclusion: We conclude that fixed (15 mCi) RAI dose is highly effective in rendering hypothyroidism in patients with GD. Age (≤42 years), thyroid uptake (≤15%) and presence of pyramidal lobe are strong predictors of hypothyroidism and must be considered for selecting optimal RAI dose. Objectives: Assess the added value of dual time point F-18-fluorodeoxyglucose positron emission tomography/computed tomography (DTP F-18-FDG-PET/CT) in the differentiation of malignant from a benign lesion in cancer patients. 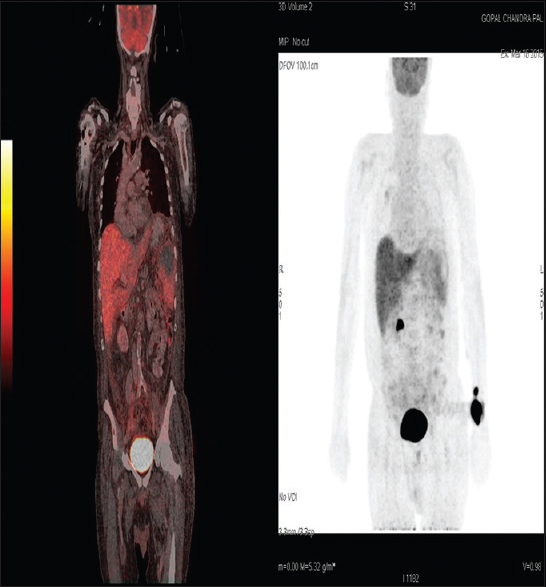 Materials and Methods: Totally, 140 F-18-FDG PET/CT scans of 60 cancer patients who underwent DTP protocol (early whole body PET/CT [E] at 60 min [range, 45-76 min] and delayed limited PET/CT [D] on areas of interest at 120 min [range, 108-153 min] after the tracer injection) were retrospectively reviewed. Visual and semi-quantitative analysis was performed on both early and delayed images. All findings were confirmed by histopathology and/or at least 3 months follow-up (F-18-FDG PET/CT, CT, or magnetic resonance imaging). The result was considered true positive (TP) if delayed standardized uptake value (SUV) of suspicious lesions increased and confirmed to be malignant, false positive (FP) if delayed SUV increased and confirmed to be benign, true negative (TN) if delayed SUV unchanged or decreased and confirmed to be benign, and false negative (FN) if delayed SUV unchanged or decreased and confirmed to be malignant. Results: A total of 164 suspicious lesions were detected (20 presacral lesions, 18 lung nodules, 18 Hodgkin's disease (HD) lesions, 16 rectal lesions, 16 head and neck (H and N) lesions, 14 hepatic lesions, 14 non-Hodgkin's lymphoma (NHL) lesions, 12 mediastinal lymph nodes (LNs), 10 focal gastric uptake, 10 soft tissue lesions, 8 breast lesions, 4 peritoneal nodule, and 4 others). Sixty-four lesions were pathologically confirmed, and 100 lesions were confirmed based on 3-6 months follow-up. There were 62 TP lesions, 44 FP, 58 TN and no FN results. 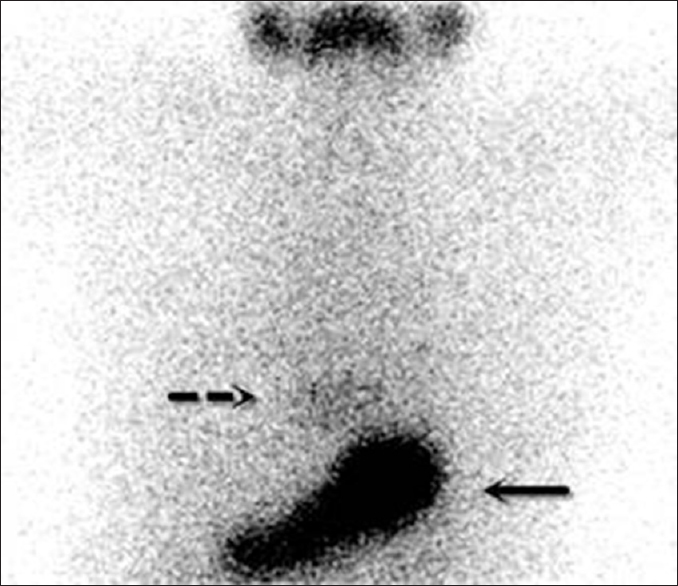 The overall sensitivity was 100% of DTP F-18-FDG PET/CT in detecting suspicious lesions. The specificity was 57% in differentiating malignant from benign lesions, and the accuracy was 73%. Positive predictive value was 59%, negative predictive value (NPV) 100%. All hepatic lesions were TP. Accuracy in metastatic hepatic lesions HD, presacral soft tissue, lung nodules, H, and N cancer, breast cancer, NHL and mediastinal LN was100%, 88.8%, 80%, 78%, 75%, 75%, 71%, and 33.3%, respectively. Conclusions: DTP F-18-FDG-PET/CT protocol does not always work in differentiation between benign and malignant lesions. However; it has high NPV, and promising results was noted in hepatic lesions, lymphoma, and recurrent rectal cancer. 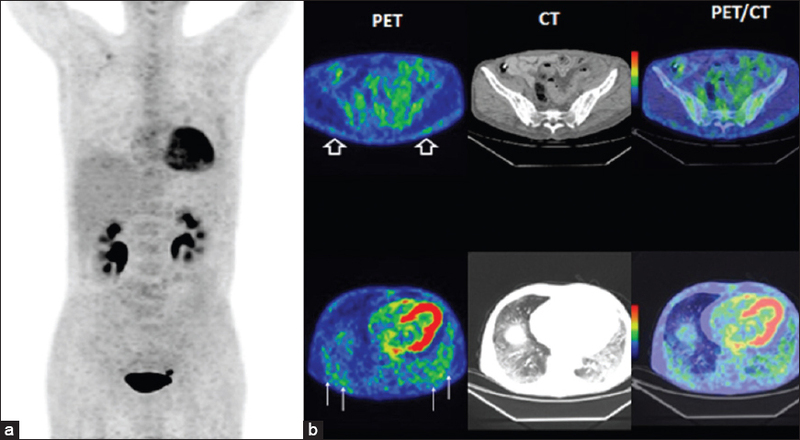 Fluorodeoxyglucose (FDG) positron emission tomography (PET) has become the common imaging modality in oncological practice. FDG uptake is seen in brown adipose tissue in a significant number of patients. Recognizing the uptake patterns is important for optimal FDG PET interpretation. The introduction of PET/computed tomography (PET/CT) revolutionized PET imaging, bringing much-needed anatomical information. Careful review and correlation of FDG PET images with anatomical imaging should be performed to characterize accurately any lesion having high FDG uptake. Developmental anomalies and anatomic variations of the thyroid gland in the general population with no known thyroid dysfunction usually goes unnoticed. Only those patients with neck swellings, incidentally detected hypo or hyperthyroidism, and those with a maternal history of hypothyroidism undergo screening for the thyroid gland. Neck ultrasound and scintigraphic techniques are the imaging tools routinely used to identify these anomalies. We present interesting technetium (Pertechnetate and sestaMIBI) scintigraphic images of adults and children who presented to our department with thyroid dysfunction showing developmental anomalies of the thyroid. Langerhans cell histiocytosis (LCH) is a rare clonal proliferative disease, with an incidence rate of 4.0–5.4/1 million individuals. LCH encompasses a spectrum of disorders with diverse clinical presentations ranging from a single organ to multiple organ involvement. 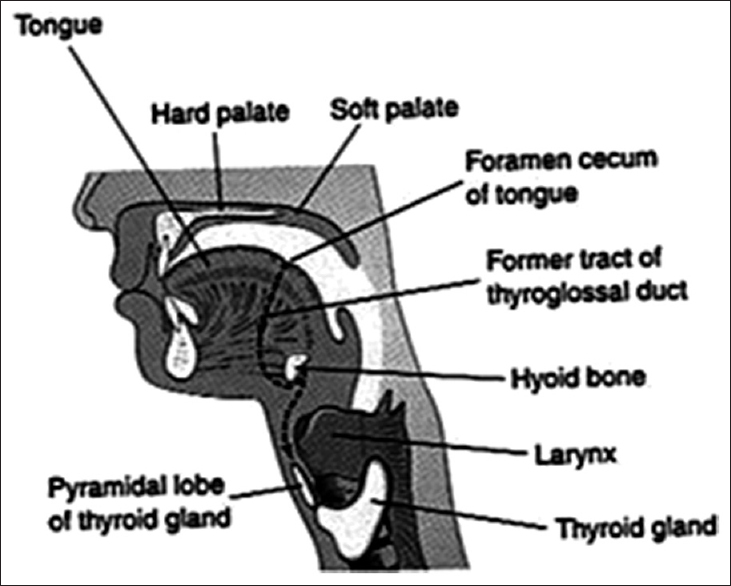 LCH rarely involves the thyroid gland. We presented a case with LCH of thyroid gland. The patient had painless progressive neck enlargement and then diabetes insipidus. Ultrasonic scan and magnetic resonance imaging scan revealed nodular goiter and pituitary stalk enlargement, respectively. Histopathological analysis revealed features of histiocytoid cells. 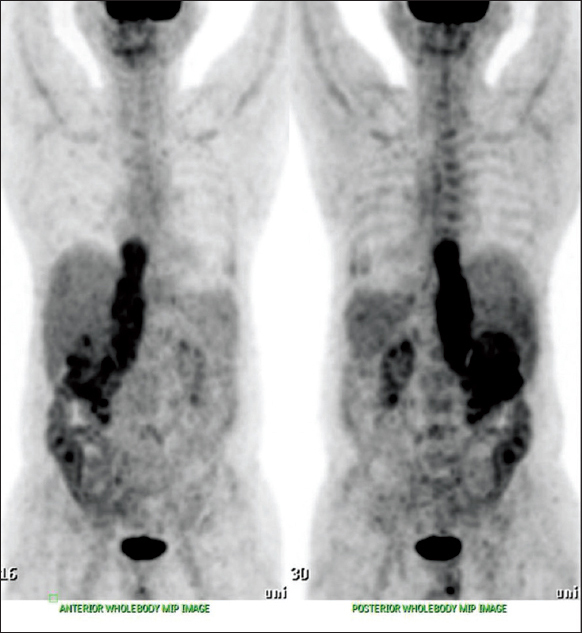 18F-fluorodeoxyglucose (18F-FDG) positron emission tomography/computed tomography (PET/CT) was performed in order to rule out the presence of whole body infiltration. 18F-FDG PET/CT also demonstrated increased uptake in the thickening pituitary stalk and maxillofacial skin lesion, in addition to the bilateral thyroid nodules, CT showed the left lung nodule and the skull destruction without 18F-FDG uptake. 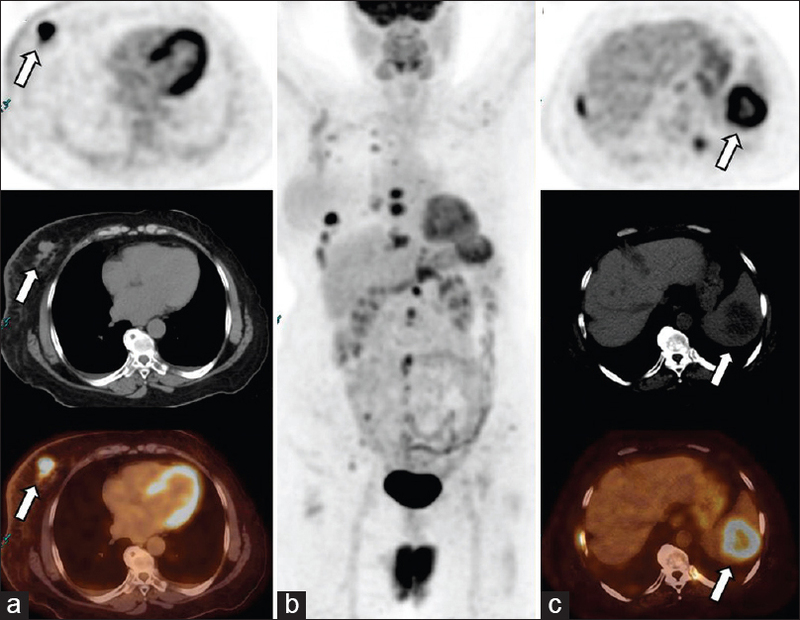 This report emphasizes the role of 18F-FDG PET/CT in multiple organs involvement of patients with LCH. Primary hepatic lymphoma represents <1% of extranodal lymphoma and predominantly seen in men older than 50 years of age. Exact etiology for these tumors is not certain yet, but presumed to be caused by certain viruses like Epstein-Barr virus and hepatitis C virus due to the frequent association of these viruses with disease. Most of these tumors are diffuse large B cell non-Hodgkin lymphoma. Direct tissue histopathology with immunochemistry may give clues about diagnosis and prognosis up to certain extent. The rituximab-based chemotherapy is the mainstay of therapy for these tumors; the role of radiotherapy is still not clear but used for management for bulky tumors. Chondroid syringoma (CS) represents the cutaneous counterpart of mixed tumor (pleomorphic adenoma) of salivary glands. The malignant counterpart of CS, termed as "malignant CS" is a malignant eccrine neoplasm which lacks distinctive clinical features, often delaying initial diagnosis. Unlike its benign counterpart which often localizes in the head and neck region, malignant CS most often encountered in the trunk and the extremities. We report a rare case of an aggressive malignant CS of the left pinna with cervical lymph node metastasis. Our patient, to the best of our knowledge, possibly is the first case of malignant CS of the pinna and the fourth to arise in the head and neck region. 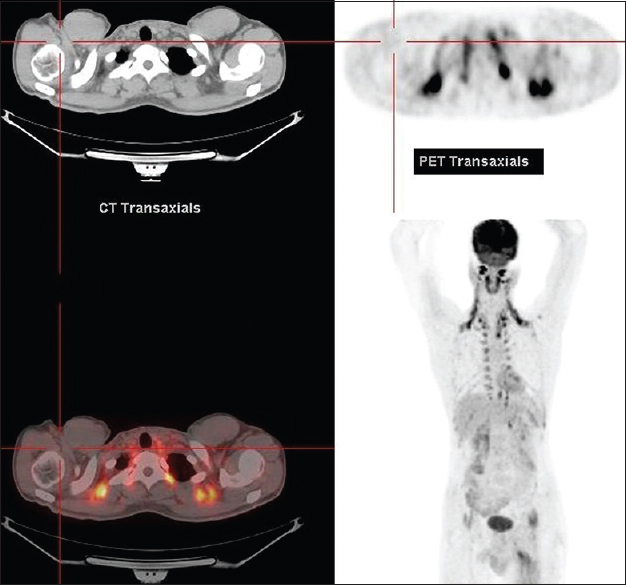 The diagnostic challenges with an added emphasis on the role of positron emission tomography-computed tomography in aiding the management of this rare tumor are discussed. Ectopic thyroid tissue (ETT) is a rare developmental anomaly of the thyroid tissue where the thyroid gland is not located in its usual position. Dual thyroid ectopia is far rarer. 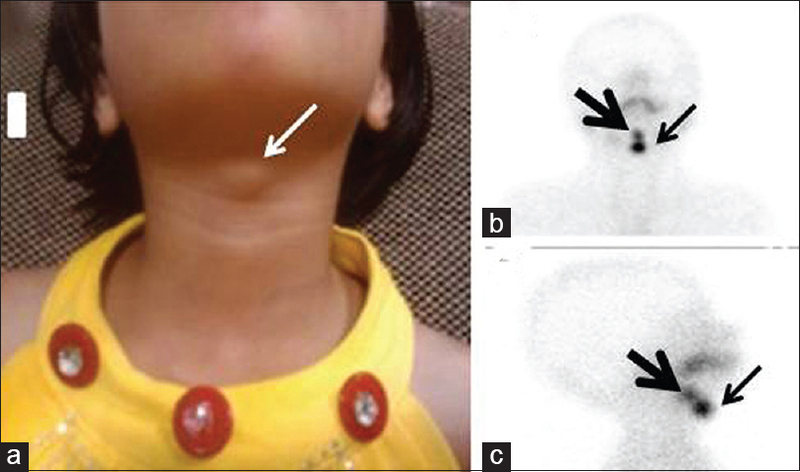 This case of a 5-year-old euthyroid girl with thyroglossal cyst was planned for surgery. Presurgical ultrasonography (USG) of the neck followed by thyroid scintigraphy was performed. 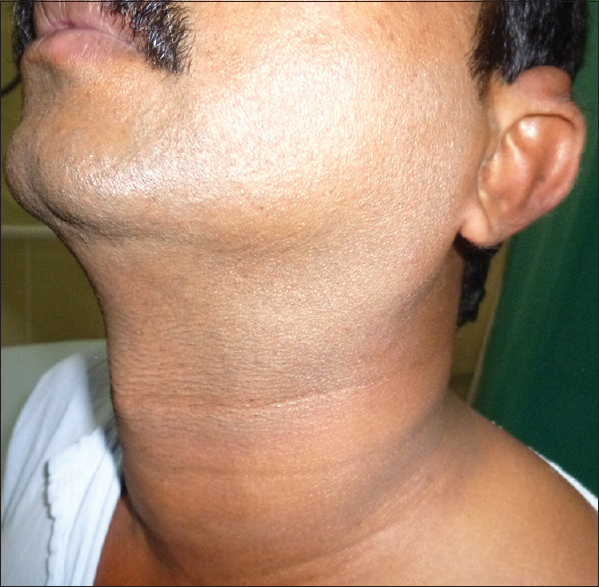 There was absent normal thyroid gland with single ETT in neck swelling on USG. However, thyroid scintigraphy revealed two ectopic foci of thyroid tissue; one was corresponding to neck swelling, and other was superior to it at the base of the tongue along with absent eutopic thyroid gland. The repeat neck USG could demonstrate the same. The present case emphasizes that, if the thyroid gland is not visible by USG; ETT should be evaluated with thyroid scintigraphy in case of thyroid dysgenesis. Co-existence of thyroid nodules with Graves' disease has been reported in various studies. 10–15% of such nodules harbor thyroid cancer with papillary thyroid cancer being the commonest. Medullary thyroid cancer (MTC) in nodules associated with Graves' disease is rare. On literature survey, we came across 11 such cases reported so far. We report a 62-year-old female with Graves' disease who also had a thyroid nodule that on fine-needle aspiration cytology and the subsequent postthyroidectomy histopathological examination was reported to be MTC. 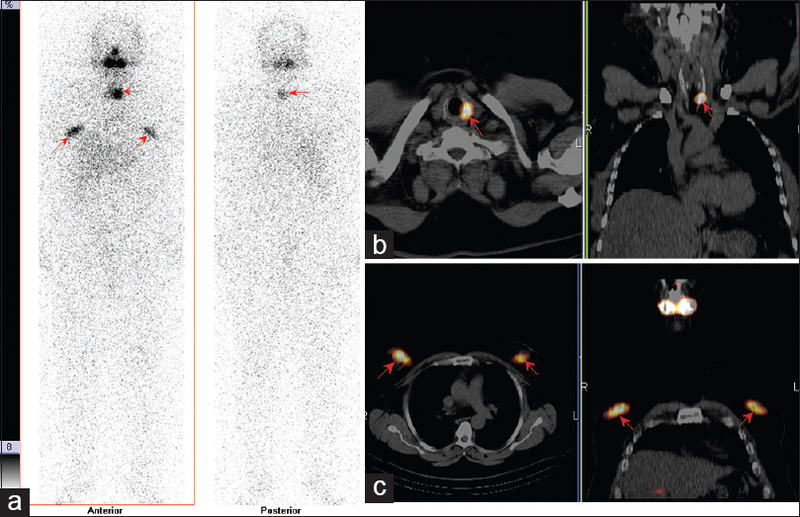 A 56-year-old male patient with papillary thyroid carcinoma was given radioiodine for the treatment of persistent disease. Post radioiodine whole body scan revealed uptake at the thyroidal region and bilateral uptake at the upper thoracic region. Single photon emission computed tomography/computed tomography (SPECT/CT) confirmed uptake at the left thyroid lobe, and additional symmetrical mammary gland uptake was observed at both breasts. The patient had obesity-related gynecomastia, but he did not have any history of breast cancer, mastitis, hyperprolactinemia, or galactorrhea. Although breast uptake of radioiodine is a common finding in postpartum or lactating women, it is uncommon in male patients. To our knowledge, this is the first case of a male patient with breast uptake of radioiodine documented with SPECT/CT. SPECT/CT is useful in male patients in the differentiation of benign breast uptake with lung metastases or axillary metastases of thyroid cancer. There are a few case reports of hiatal hernia demonstrating thoracic uptake on I-131 scintigraphy. In this case, high thyroglobulin levels in combination with misinterpretation of I-131 uptake in the mediastinum, leaded to mismanagement of the patient. Here we present a case of focal I-131 uptake within a hiatal hernia initially mimicking an isolated mediastinal metastasis. There are many potential causes of false-positive I-131 scan result. In this case, adjunctive chest computed tomography and gastroesophageal barium study helped to elucidate the true nature of this I-131 uptake. False-positive findings may be caused by a wide variety of nonthyroidal carcinomas, which can concentrate radioiodine or from skin contamination. Several organs, such as the gastric, salivary glands, renal cyst, pericardial effusion, and ovarian can accumulate I-131. It should be borne in mind as a potential source of false-positive whole-body I-131 imaging. Systemic sclerosis (SSc) is a rare autoimmune disease, which may affect multiple organ systems. 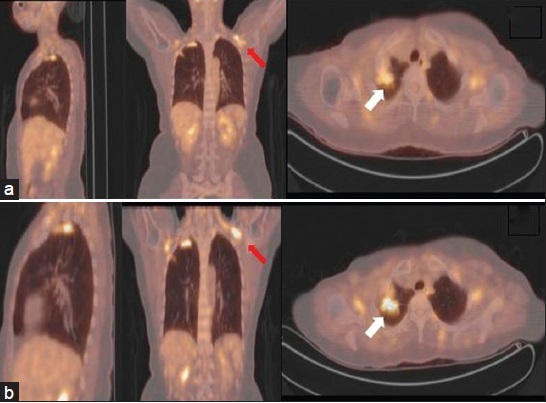 Fluorine-18-fluorodeoxyglucose (18F-FDG) positron emission tomography/computed tomography (PET/CT) can demonstrate the degree and anatomical extent of involvement in the entire body and coexisting malignancies in connective tissue diseases. We present a case of SSc with an increased 18F-FDG uptake in the cutaneous and subcutaneous tissues even higher than the neighboring skeletal muscles ("flip-flop phenomenon," that is, an increased 18F-FDG uptake in the skin but a decreased 18F-FDG uptake in the skeletal muscles). Sarcoidosis is defined as a multisystem granulomatous disorder of unknown cause. Venous thrombosis (VT) in the sarcoidosis is rare. 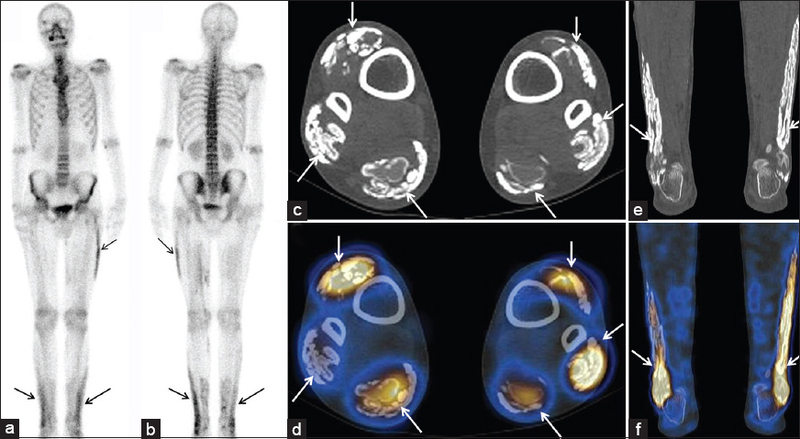 The routine use of 18F-fluorodeoxyglucose positron emission tomography/computed tomography (18F-FDG PET/CT) has resulted in clinicians detecting many incidental findings, which have proven to be clinically significant such as thrombosis. Here, we present a case with VT of sarcoidosis in the inferior vena cava and portal vein as an unusual incidental finding on 18F-FDG PET/CT. Tumor thrombus is a rare complication of many solid tumors. We present a case of renal cell carcinoma whose baseline contrast-enhanced computerized tomography (CT) revealed an heterogeneously enhancing mass in the upper half of right kidney with tumor thrombus in the right renal vein extending to suprarenal inferior vena cava (IVC), crossing the cavoatrial junction and reaching up to the right atrium (Grade IV). 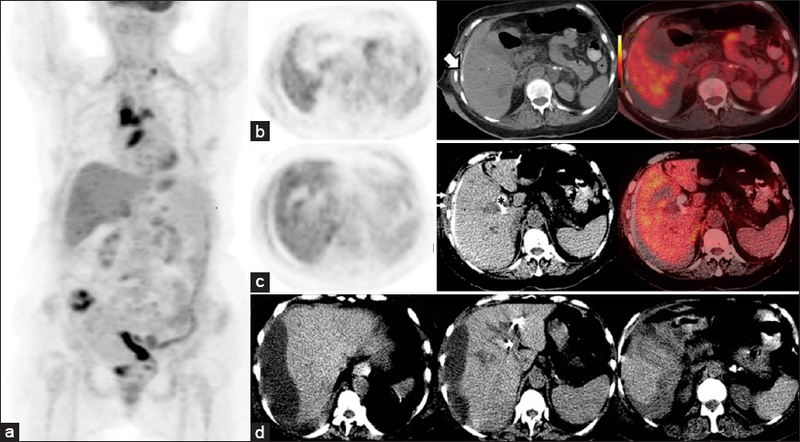 Fluorine-18 fluorodeoxyglucose (18F-FDG) positron emission tomography (PET)/CT imaging revealed large irregular right renal mass, hypermetabolic tumor thrombus extending from the right renal vein to suprarenal IVC reaching up to the right atrium. There was no FDG uptake noted in the infrarenal IVC and bilateral iliofemoral venous thrombi. Thus, 18F-FDG PET/CT was not only helpful in the staging, but was also helpful in differentiating tumor thrombus from bland thrombus in our patient. Papillary and follicular thyroid carcinomas, together known as differentiated thyroid carcinomas (DTC), are among the most curable of cancers. Distant metastases are rare events at the onset of DTC. Among these presentations, metastasis to the liver is even more unusual. Only 11 cases of DTC with liver metastasis were previously reported in the literature. 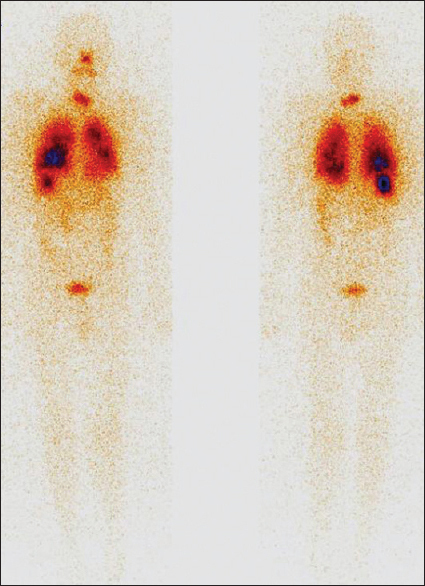 We present a 55-year-old male on Iodine-131 whole body scintigraphy showed intense uptake in thyroid bed, metastasis in both lungs and right lobe of the liver. 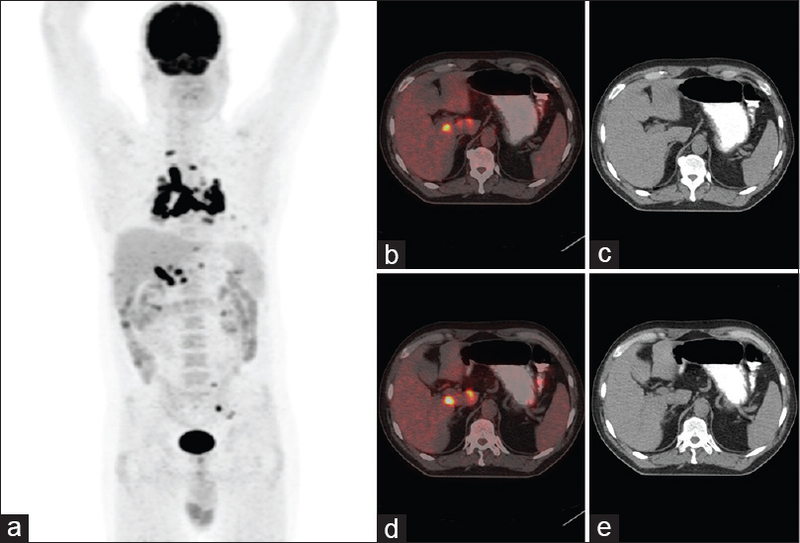 Radioiodine concentration in liver metastases made him amenable to high-dose radioiodine therapy patient. We present the case of a 35-year-old man with calcinosis, Raynaud's phenomenon, esophageal dysmotility, sclerodactyly and telangiectasia variant scleroderma who presented with dysphagia, Raynaud's phenomenon and calf pain.99mTc-methylene diphosphonate bone scintigraphy was performed to identify the extent of the calcification. It revealed extensive dystrophic calcification in the left thigh and bilateral legs which was involving the muscles and was well-delineated on single photon emission computed tomography/computed tomography. Calcinosis in scleroderma usually involves the skin but can be found in deeper periarticular tissues. Myopathy is associated with a poor prognosis. We present a 10-year-old boy having the bronchiectasis who was subjected to lung perfusion scintigraphy before lung resection surgery to assess the lung parenchymal function. It revealed unusual tracer distribution in right upper body that was mimicking to be liver. It was unusual unless there were some shunts bypassing the lung uptake or faulty radiopharmaceutical preparation. However by bringing down the image window, it became clear that radiopharmaceutical distribution was in thorax only correlating with lung uptake, and not in the liver. 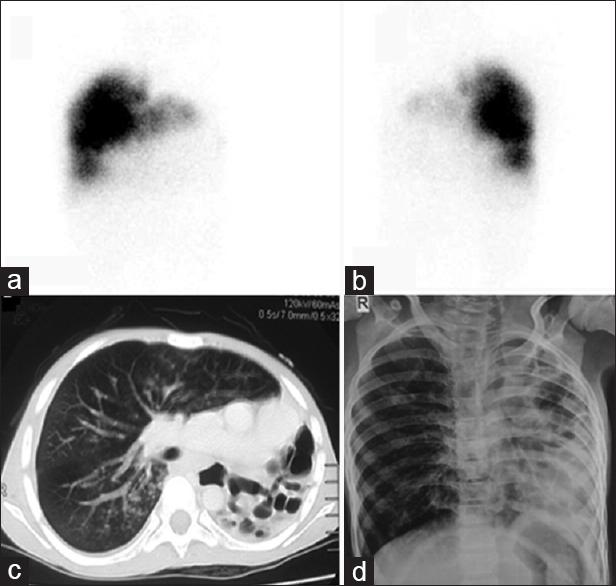 Corresponding X-ray chest and computed tomography thorax demonstrated multiple cystic lesions in left lung parenchyma. A 30-year-old woman with hyperthyroidism was admitted to hospital. 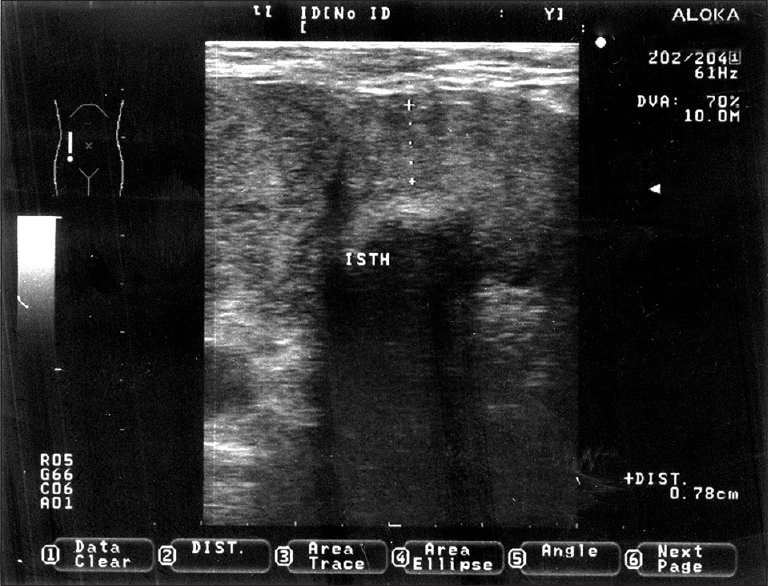 Although increased thyroid function was found, the gland was normal in ultrasonography (USG). Additionally, thyroid iodine uptake and Tc-99m pertechnetate scintigraphy was normal. Abdomen USG detected a cystic pelvic mass in left ovary. A whole-body scan was performed 48 hours after oral ingestion of 29.6 MBq (0.8 mCi) I-131 (iodine-131) revealed a round structure located to the left lower abdomen. Iodine uptake was detected in this cyst which was compatible with functional thyroid tissue demonstrated by SPECT/CT. The patient was underwent surgical operation and histopathology confirmed mature cystic teratoma. Accurate localization and depiction of thyroid tissue in ovary mass was provided with SPECT/CT. Subcapsular collections of bile, air or blood in the liver have been described following transhepatic procedures due to the leakage of bile and blood from the percutaneous puncture at the surface of the liver. Herein we presented the subcapsular collection led to a mismatch between functional and anatomical boundaries of the liver.